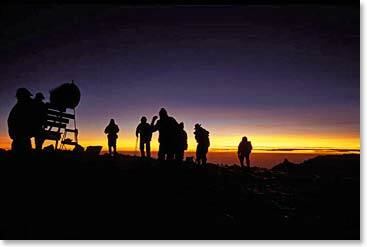 Early this morning, we received a call from Eric saying that the team made it to the summit of Kilimanjaro, the rooftop of Africa at 19,640ft/5895m. After their morning summit, they traveled back down the mountain to rest for the evening. Tomorrow they will return to the park gates where they will celebrate their success with their mountain staff before returning to Arusha. Congratulations to Bob, Kyle, Michael and Ryan! 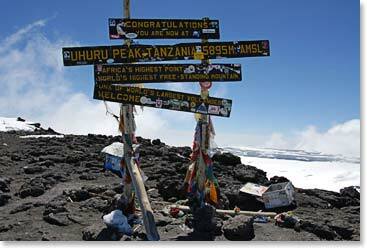 This famous sign marks the spot - Kilimanjaro’s summit.